Libyan rebels laying siege to Bani Walid, one of Muammar Gaddafi’s remaining strongholds, say surrender talks have broken down and that they’re ready to attack. Thousands of fighters were moving toward the town from three sides Saturday, according to a senior rebel official from the area, Mahmoud Abdel-Aziz, who is also involved in the surrender talks. Some fighters had pushed to within six miles of the town, but stopped to avoid being accidentally targeted in Nato air strikes. “If they don’t raise the rebel flag tomorrow, we will enter with force,” Abdel-Razak al-Nathori, a rebel, said yesterday. The Libyan regime crumbled after rebels seized Tripoli, the capital, in a weeklong August battle that came six months after the civil war began in February. Since Tripoli’s fall, rebel fighters have been advancing toward a number of key loyalist targets, including Bani Walid, Gaddafi’s hometown of Sirte and the southern loyalist stronghold of Sabha. Relatives of Gaddafi and close associates are still believed to be in Bani Walid, including a Gaddafi cousin, Ahmed Ibrahim, said Abdel-Baset Naama, a rebel official. At least two of the former dictator’s sons have recently been in the town, rebels say, and some believe Gaddafi himself may be hiding in Bani Walid â€“ a bastion of Gaddafi support because it had benefited in recent years from the regime’s patronage system. 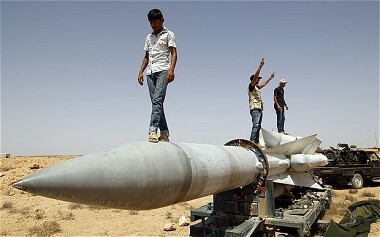 “The people of Bani Walid want the rebels, but associates of Gaddafi are still inside,” Naama said. Abdel-Aziz said he had met a delegation of Bani Walid tribal elders Saturday, and they told him that they were not willing to give up. “We have given the people of Bani Walid many chances,” he said. Mr Al-Nathori said one of Gaddafi’s sons, Muatassim, was in Bani Walid on Saturday, apparently to persuade tribal leaders to remain loyal to the crumbling regime. Another Gaddafi son, Saif al-Islam, was also there at some point but fled, said al-Nathori, speaking in the town of Tarhouna, about halfway between Tripoli and Bani Walid. Still, the rebels say they have been negotiating with tribal elders in the town, trying to get them to surrender. The town, located some 90 miles southeast of Tripoli, is a base of the 1-million-strong Warfala tribe, one-sixth of Libya’s population. In an audio message Thursday, Gaddafi said the Warfala would be among the tribes that would defend him to the death. But Bani Walid also has a history of opposition to Gaddafi. Western diplomats in Libya and opposition leaders abroad reported in 1993 that the air force had put down an uprising by army units in Misurata and Bani Walid. They said many officers were executed and arrested.